I’m really delighted to announce Hollywood will be open and celebrating Earth day 2014 with Green Sod Ireland as part of one of its fundraising WildAwake walks on Tuesday 22 April, 2014 at 5.30pm.Mary White of BlackstairsEcoTrails.ie will lead Green Sod Ireland Earth Day WildAwake Blackstairs, Co. Carlow walk at 5.30 pm, Tuesday 22 April 2014. Photo above: Green Sod Ireland. This has developed from a coincidental meeting I wrote about a few months ago when I meet members of Green Sod Ireland and Mary White (blackstairsecotrails.ie) who were walking right past Hollywood. 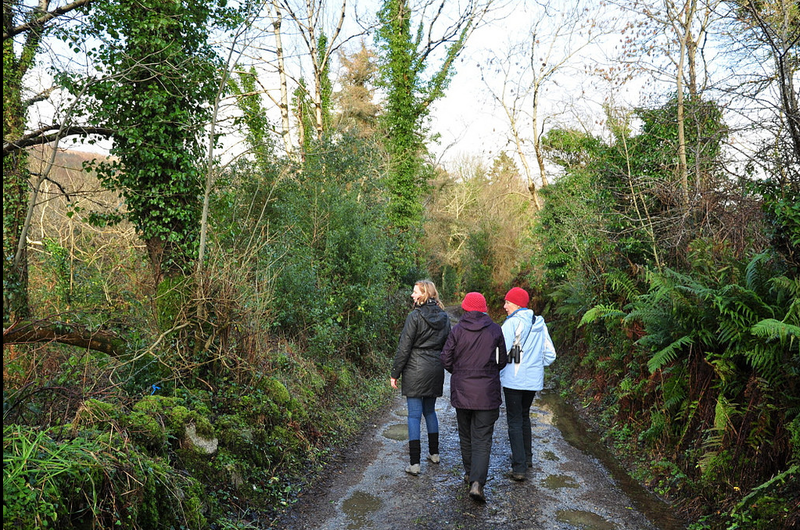 Join for a slow walk at the foot of the Blackstairs. We will look at the gently rolling heather clad hills with their lichens and ferns. We will look for herbal delights and lovely Spring flowers to guide us on our way. We will discover stunning Spanish Chestnut Trees and marvel at stone paved streams running under small granite bridges. A walk to look at the small natural wonders in our local environment. Suitable for all ages and for children from 10 upwards. We leave no trace! Green Sod Ireland’s vision is working to establish WildAcres in every county in Ireland; safe havens where species can thrive and flourish. Since The Trust works with local communities and encourages them to live in harmony with nature. It also works to advance education by promoting and encouraging public awareness of the importance of conserving land and protecting the environment for the benefit of present and future generations. Soon after I first met members of Green Sod Ireland they asked if I could develop an eco art residency. I’m a bit overwhelmed with the workload in my eco art phd but I offered to take photos and to bring Green Sod WildAwake walkers into Hollywood after Mary White’s guided walk (this seemed to tie in nicely as Mary was involved in the planting of Hollywood in the mid-1980s but you can hear more about that on the walk). Mary’s Green Sod walk (see above) is through lanes that circle the top of the valley under Mt Leinster. It ends on the lane that runs alongside Hollywood. Holly, our dog, will be helping me share our Hollywood project on Earth day. I’m always interested in sharing the knowledge of my project and because I work across disciplines, often interesting and unexpected discussions can emerge. I’ve decided on Green Sod’s WildAwake walk to share the more ecological side of the Hollywood project as an introduction to the art and forest politics I also work on. Hollywood is very small, about 2.5 acres although the trees are quite big now at nearly 30 years old. Yet even on this small site I’m keen to show that an eco art project can progress a variety of understandings that can really complement professional forest discussions in how we might adopt new ideas of permanent, non clearfell forestry for Ireland. Also, many eco art projects have an underlying theme of uncovering new ideas about sustainability. Someone reminded me last week that sustainability and resilience for the future is really all about community, and community is all about relationships. I hope my project will show the forest management we use here is fostering more sustainable relationships between different flora and fauna species, ourselves and our wider community. What I will show, weather permitting, are two different areas of Hollywood that reveal the story of how one can transform a conifer plantation into a forest. Last summer after ecologist Faith Wilson’s visit I set up several permanent 10 x 10 m quadrants with bright orange builders string (thanks Martin and Albert!). I am now logging changes in flora in these quadrants each year. These quadrants I have found are great to show people unfamiliar with new-to-Ireland Close-to-Nature continuous cover forestry management how such practices are rapidly changing and improving Hollywood’s biodiversity and resilience. The quadrants show contrasting areas in the conifer plantation; one as it was when we started transforming the conifer plantation in 2008, to another area where native tree species are rapidly and naturally regenerating. Do feel free to come on the Green Sod Blackstairs walk, Register/Donate here or forward this event info to others. Thanks to Green Sod Ireland and Mary White @blackstairsecotrails.ie for inviting me to share a conversation about a new type of forestry on Ireland’s Earth day.